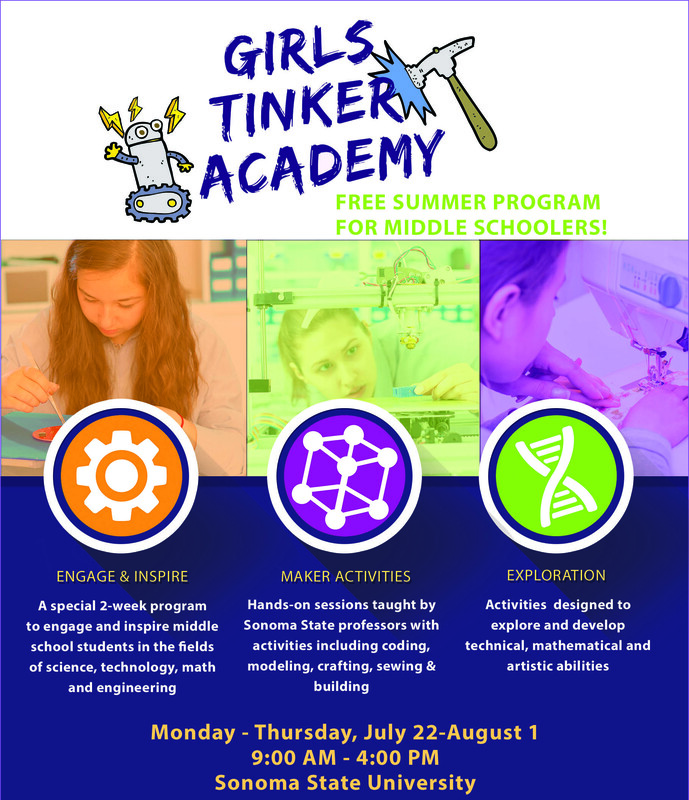 The Girls Tinker Academy is a two-week program designed to engage and inspire middle school students in Maker activities to encourage the exploration and development of technical, mathematical, and artistic abilities. For Summer 2019, twenty-four middle school students from across Sonoma County will be selected to attend the hands-on sessions to be taught by SSU Math professor, Natalie Hobson, and a team of outstanding undergraduate student techs in the SSU Makerspace (2nd floor of the SSU Library). They will participate in a variety of activities including coding, modeling, crafting, sewing, and building. Students must provide their own lunch! Academy Instructors: SSU faculty committed to broadening participation in STEM (science, technology, engineering and math) are leading the Academy. Sonoma State students will be assisting and serving as mentors. Be current middle school students (entering 7th, 8th, or 9th grade in August 2019). Attend a middle school in Sonoma County. Recommendation from Math or Science Teacher – CTE Foundation will send the recommendation form directly to the teacher contact provided in the application document. The application is due by Wednesday, May 1, 2019 at 4:00pm.